MarinMOCA will feature work by Deborah Sullivan, whose unique photographs will be on display in an exhibition entitled “Actuality, Reminiscence, and Fabrication.” Sullivan's photographic images seem like stills from a dream or attempts to recover a faded memory, but she brings them down to earth by adhering them to silk, polyblended materials, linen, aluminum, wood and clay. Their ethereal quality is in productive tension with the emphasis on unusual, and often heavy materials, giving viewers a meditative experience that is all the while grounded in physical presence. Don't miss this powerful exhibition that explores the possibilities of the photograph. Artist Talk: October 6, 4-5 p.m. Reception: October 6, 5-7 p.m. The Marin Museum of Contemporary Art in Novato, California, presents LEGENDS OF THE BAY AREA, honoring artists whose exhibition history and dedication to art education and mentoring have left a significant imprint on the local, national, and international art world. 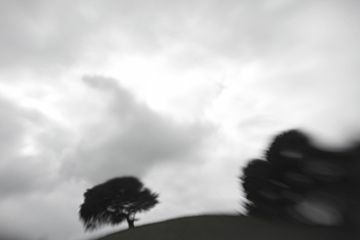 This year’s exhibition features San Francisco artist David Maxim. Maxim’s work has been described as “heroic” or “theatrical,” and while those adjectives describe much of the work on display, the MarinMOCA exhibition focuses primarily on the way Maxim’s work engages, suggests, or reveals the human figure. At one end of the spectrum, Maxim’s monumental, non-representational, mixed media paintings take on a bodily presence through their size, often with 3-dimensional components that reach out to the viewer. Other mixed media paintings include mark making and shapes that dynamically suggest the gestures of the human body, for example, a simple combination of rectangles and spheres hinting at a reclined figure. Finally, several of Maxim’s works include 3-dimensional figures extending from the picture plane to crawl across the canvas or participate in a tug-of-war, hanging like marionettes in front of a dramatically painted canvas that provides an emotional tone even as it resists placing the action in a particular location. The setting for the figurative artworks, whether a wall piece or sculpture-in-the-round, remains a mystery for the viewer, although Maxim can’t resist bringing his art historical knowledge to bear on his artwork, as in Blind Leading the Blind, which makes reference to the Flemish Renaissance painter Pieter Bruegel. Figures, particularly the anonymous, faceless ones that populate Maxim's work, stand in metaphorically for philosophical notions of the human condition, and Maxim seems to consciously construct situations that represent common struggles. The figure in The Elusive Thought attempts to cast a net, although the target remains unclear. The figure in A View of the World looks up into space through a framed and vision-limiting screen. Even when pointing to struggles, however, Maxim’s work is classically beautiful, reminding viewers of our connections rather than our differences. It is this deft balance between theatrical expressionism and conscious serenity that makes for an artistic legend. David Maxim’s work has been shown throughout California, across the United States, and into Europe. Born in Los Angeles in 1945, he received a Bachelor’s Degree and Master’s Degree in Art History from the University of California, Los Angeles and taught art history at California State University, Los Angeles, UC Santa Barbara, and Santa Barbara City College before moving to San Francsico in 1976. 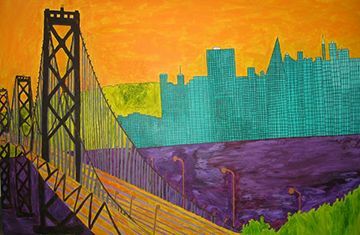 At CSU Hayward and the San Francisco Art Institute, he taught art history for the studio artist, and in 1979 participated in the exhibition “New Bay Area Images” at the Oakland Museum, solidifying his place in the Bay Area art world. He received an Artist Residency at the Dorland Mountain Colony in the 1980s, and a Ludwig Vogelstein Foundation Grant in the 1990s. His work is displayed at Universities and in private collections in the U.S. and Europe. The Marin Museum of Contemporary Art presents its Fall National Exhibition, juried this year by Renny Pritikin, Director of The Richard Nelson Gallery and The Fine Arts Collection, University of California, Davis. Pritikin selected 40 artworks from hundreds of entries to design an exhibition that reflects the strongest offerings from American artists. The juror requested an open theme, which gives artists the opportunity to enter their best work, and the diversity of artworks will impress any visitor. Two mixed media artworks by artist Monica Lundy explore the ways in which mug shots identify their subjects as criminals long before the due process of law. Titled only by the visible portions of their booking numbers, 0-3559 and 0-3082 represent two women convicted of prostitution in the 1940s. As Lundy explains, the use of both gritty, pulverized charcoal and glittery mica flakes in the artwork represent the "dualities of seduction and ruggedness inherent in the lives of the subjects." A mysterious and sublime landscape by photographer Michael Strong depicts and is entitled Point Lobos, a location on the California coast. 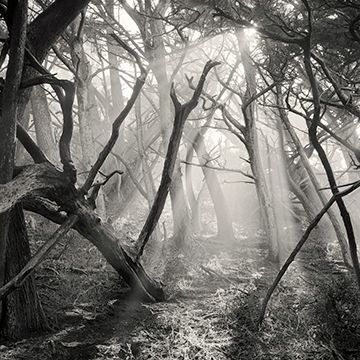 The sepia toned silver print captures a combination of haze and sunshine breaking through a maze of barren tree limbs over a patch of ground crackling with dry twigs and leaves. The image is simultaneously breathtakingly beautiful and eerily calm, suggesting a type of isolation some would welcome, but others would fear. Konstantin Zlatev makes peaceful music out of instruments of war with Chifte Kavali (Double Barrel Flute). 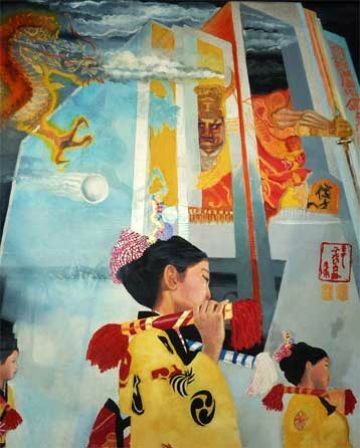 Zlatev describes the artwork as the “transformation of a shot gun into a harmonious flute that plays music as a symbol of our intellect and humanity. The programmable robot charts and musically depicts the rise and fall of US arms exports.” The artworks will inspire awe with their beauty, and productive discussion from their content and subject matter. 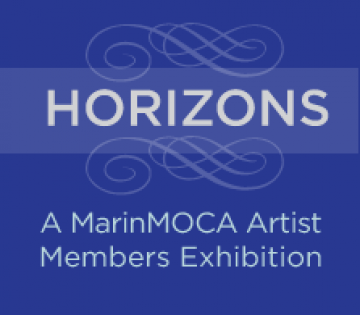 HORIZONS is open to MarinMOCA Artist Members. The theme is intentionally open, allowing artists to enter work ranging from landscape, cityscape, or seascape, to a surreal or abstract mindscape. HORIZONS could also be taken to mean what is “on the horizon,” referring to the future or futuristic themes, or the need to “broaden my horizon,” meaning that one needs to open or be open to greater possibilities. You are invited to submit one original work not previously shown in a MarinMOCA or Artists of MarinMOCA exhibition. In accordance with the exhibition theme, please submit work completed in the past year. All media is acceptable except video and film. This show is juried for awards only. Juror: Jennifer Bethke is Curator of Art at the Sonoma County Museum. Jeffrey Sully's work stands out for its experimentation with form. His canvases are sculptural and play with our expectations of the relationship between positive and negative space. His color palette runs either extremely hot or extremely cool, with vibrant reds and yellows in one artwork providing productive tension against the blues and greens in another. This deft play with space, shape, and color, however, is only the beginning of Sully's experimentation with form because what is especially striking is his use of line. His paintings take on the feel of a contour drawing, with the shaped edges of the stretched canvases curving in and out in calligraphic fashion and refusing the restrictions of a rectangle. Even as the outside edges suggest sophisticated contour lines, the activity on and within the canvas is equally intriguing, either through cut outs in the center of the canvas, or through expressive brushwork across its flat surface. The gallery wall becomes part of the artwork when it is revealed through a hole in the canvas or fills up the deep curves of a painting's outer edges. Once the viewer gets used to the unusual shapes of Sully's paintings, the artworks take on a somewhat poetic meaning. The paintings seem like letters in a foreign language, or even punctuation marks asking us to pause, to stop, or to exclaim. Sully's artwork titles, with references to Sumer, dust, rebirth, or tide suggest that the artworks are in the process of change, as if they could be remnants of a past and powerful civilization, objects subject to the forces of nature, or gestures toward yet unknown possibilities. The MarinMOCA National Juried Exhibition series gives artists from across the country the opportunity to show their work at a professional, established venue, and gives visitors to MarinMOCA the opportunity to see a wide variety of artworks by contemporary American artists. We work with jurors familiar with the history of American art as well as trends within the contemporary art world so that artists entering their work know that a skilled and experienced professional, often a curator, critic, or gallery director, will be reviewing and selecting the entries. Our 2012 Summer National Exhibition juror is Lucinda Barnes, Chief Curator & Director of Programs & Collections, Berkeley Art Museum and Pacific Film Archive. Barnes joined the B.A.M. staff as Senior Curator for Collections in April 2001, and in 2007 was named Chief Curator and Director of Programs and Collections. Prior to coming to Berkeley, Barnes was E.D. of the Boise Art Museum, Idaho. She served as Curator of Collections at the Museum of Contemporary Art in Chicago, Curator of Modern and Contemporary Art at the Allen Memorial Art Museum at Oberlin College, and held senior curatorial posts at the Newport Harbor Art Museum (now the Orange County Museum of Art) and the University Art Museum, CSU Long Beach. Barnes has taught at a number of colleges and universities. She received her B.A. from New York University, an M.A. from Williams College, and Ph.D. (ABD) in Art History at the University of Southern California. In 2008-09 Barnes served as a UC Berkeley Townsend Center for the Humanities Fellow. At the Berkeley Art Museum Barnes has curated and co-curated a wide range of exhibitions, including Joan Jonas: the Shape, the Scent, the Feel of Things (2007), Mahjong: Contemporary Chinese Art from the Sigg Collection (2008), Human/Nature: Artists Respond to a Changing Planet (2009), Indeterminate Stillness: Looking at Whistler (2010), and Abstract Expressionisms (2012). In addition, Barnes has served as curator-in-charge of major traveling exhibitions at BAM, such as Enrique Chagoya: Borderlandia (2008), James Castle: A Retrospective (2010), What’s It All Mean: William T. Wiley in Retrospect (2010), and Kurt Schwitters: Color and Collage (2011). 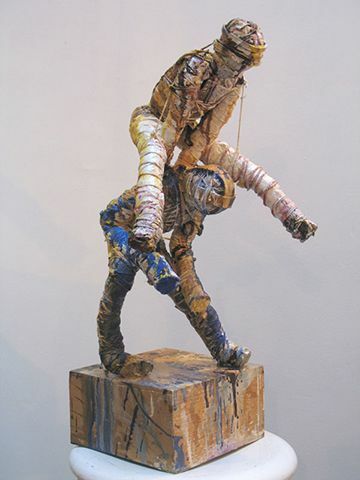 Gloria Matuszewski and Teri Vereb were the 1st place winners of the 2011 MarinMOCA Member Exhibitions, and their work will be on display in the Ron Collins Gallery concurrent with the Summer National Juried Exhibition. Gloria and Teri, though dramatically different artists in many ways, break down images into fragments of color, shape, and line to kaleidoscopic effect. Gloria's quietly meditative compositions harmoniously merge geometric and textural shapes, providing surprises for the patient viewer who takes a closer look. Teri's work calls out to the viewer from a distance with active and energetic lines, strikingly realistic images, and vibrant contrasts in color and value. These artists provide two perspectives on the concept of kaleidoscopic, and are two artists viewers will not soon forget. 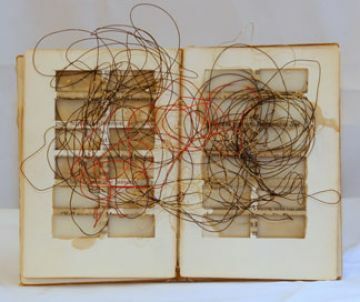 Talk by Lisa Kokin: May 6, 3 p.m.
Come see the work of 150 Bay Area artists who make use of old, discarded books to create 150 unique “book art objects” including collage, mixed media, handmade artist books, book sculpture, jewelry, book boxes, hanging mobiles and “altered books”. All works are offered in a 5 week long SILENT AUCTION running from April 21 through May 26. Show closes with a Live Auction Closing Party on Saturday, May 26 (5-7 pm). 100% of the proceeds go to support MarinMOCA's programs and activities. Don't miss this eclectic, highly creative show. 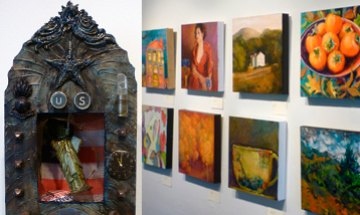 It is full of whimsy and humor as well as some serious art work by many well known Bay Area artists. The Marin School of the Arts is an award-winning arts academy within a public high school setting. MSA offers talented and motivated students the opportunity for professional arts instruction and practice while fulfilling all requirements in math, science, language arts, physical education and other elective programs at Novato High School. The artists featured in the MarinMOCA Ron Collins Gallery were the winners of the 2011 Marin School of the Arts/Novato High School's Annual ArtFest, a competition for Senior High School students at Marin School of the Arts. The 2011 award winners were offered this exhibition at MarinMOCA to celebrate their achievements and give the public an opportunity to see the incredible work done by young local artists. Featuring the work of Modesto Covarrubias, Ali Naschke-Messing, and Angie Wilson. The Marin Museum of Contemporary Art in Novato, California, will present INDEXICAL MAKERS, featuring Modesto Covarrubias, Ali Naschke-Messing, and Angie Wilson, emerging artists whose work dynamically integrates form and content. The exhibition title, a play on the term “Indexical Marker,” refers to 2 key aspects of the work. The artwork is "indexical" in that it points to something else—it directs the viewer's attention to and often becomes a trace of another occurrence or physical object. “Makers” refers to the ways the artists employ craft-based tactics in their artistic practice. To refer to these artists as “makers” acknowledges the historical divide between the creation of so-called "fine" art, and the craft traditions of “making” objects, of “making do” with everyday materials often degraded by art institutions. Modesto Covarrubias utilizes knitting in his performance and installation pieces as a way to investigate psychological and emotional connections to physical environments. His knitting performances produce objects that serve as a trace of the actions of the performer, and his installations often engage the decor and design of a room, bringing attention to aspects of the space otherwise unnoticed by the viewer. Ali Naschke-Messing describes her method as one of extreme “site-responsivity.” Her thread-based installations poetically echo existing architectural forms or subtly chart the daily movement of light and shadow across the wall, ceiling, or floor. Her work is as much about the act of viewing as it is about the intricate form of her installations, as they require a form of patient looking akin to listening to a whisper. While they are definitely a striking beautification of commonness, they also hint at the infinite. 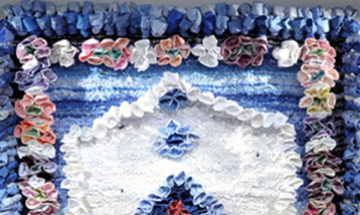 Angie Wilson's primary medium is used work shirts, physical traces of anonymous laborers, woven into Persian carpet motifs or other craft objects. Wilson's artwork simultaneously weaves together questions of outsourced craft production, the mass production of the handmade, and the growing importance of re-usable materials. INDEXICAL MAKERS are artists whose conscientious use of materials encourages us to patiently re-view our immediate physical environment, and to be mindful of the makers behind the seemingly simple, everyday objects within that environment. Modesto Covarrubias is a native of the San Francisco Bay Area, currently residing in Berkeley, California. 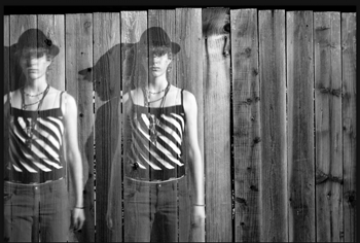 He works in a broad range of media, including photography, video, installation, printmaking, and performance. His work has been exhibited nationally and internationally at such spaces as the Galleria Civica de Modena in Italy, the Center for Contemporary Arts in Santa Fe, New Mexico, the San Jose Institute of Contemporary Art, and the San Francisco Arts Commission gallery. He studied architecture at UC Berkeley, received a BFA in Photography from the San Francisco Art Institute, and received an MFA in Studio Art from Mills College, receiving a Herringer Family Award. Covarrubias's background in architecture influences his performances and installations, in which he investigates the experience of space, and how a space can both alter and be altered by one's mental state. Ali Naschke-Messing attended the University of Barcelona and Columbia University, earning her BA in Liberal Arts from Sarah Lawrence College in New York, and her MFA from the California College of Art in San Francisco. 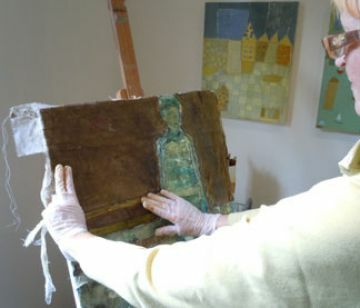 Her work has been exhibited in California, Florida, and New York, and she has served as instructor and guest lecturer at institutions such as the Mission Cultural Center for Latino Arts in San Francisco, CA, CCA, the College of Marin in Kentfield, CA, and in San Francisco through the Valand School of Fine Arts, Gothenburg, Sweden. She is currently an Affiliate Artist at the Headlands Center for the Arts in Sausalito, CA, and was an Irvine Fellow at the Lucas Artist Program at Montalvo Arts Center in Saratoga, CA. 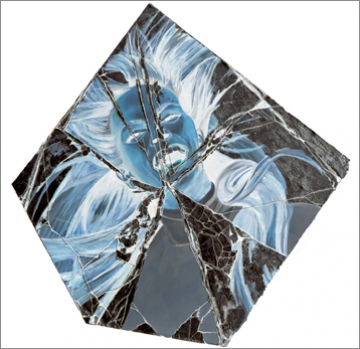 Her work explores light, presence, and connection in sculptural form, and she often employs immaterial media such as perception, reflection, and refraction to make site-specific installations. Her work changes in accordance with a given environment, formally highlighting existing structures and forms, while hinting at the intangible. Angie Wilson was born in Tacoma, Washington and received a BA in Russian from Reed College in 2003, and an MFA from San Francisco State University in 2011. She is currently a Graduate Fellow at the Headlands Center for the Arts and lives in Oakland. Her work has been exhibited throughout the Bay Area and in Oregon, and she has presented lectures on the formal and conceptual concerns in her art at San Francisco State University, California College of the Arts (Oakland, CA), UC Berkeley, and Reed College (Portland, OR). Her work investigates labor, consumerism, and the handmade to question cultural consumption while reflecting on traditions of re-use in the midst of economic crisis. Through repurposing and reconfiguring preexisting materials, she develops a powerful connection between her work as an artist and the anonymous labor of rug weavers and industrial garment manufacturers. The first 2012 MarinMOCA Artist Members exhibition will feature new work by our artist members. Visitors will find a variety of artworks and styles, from sculpture and jewelry to photography and painting, and from extreme abstraction to striking naturalism. 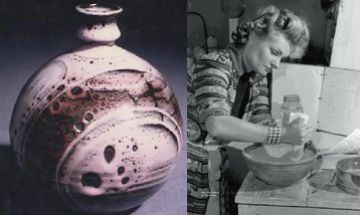 The Marin Museum of Contemporary Art at Hamilton Field in Novato will present MARY TUTHILL LINDHEIM: AGENT OF CHANGE, featuring the work of the late Bay Area ceramicist, sculptor, and activist, Mary Lindheim (1912-2004). It will be the first museum exhibition of Lindheim’s work since her death, and the most comprehensive solo show ever of her work. MarinMOCA Executive Director, Heather Murray, will curate the exhibition in close collaboration with the artist’s estate and Abby Wasserman, editor and essayist of the recently published Mary Tuthill Lindheim: Art and Inspiration (Cameron and Company, 2010). The exhibition honors Lindheim, who lived in Sausalito and Bolinas for the last 65 years of her life, not only as an artist but as someone passionately dedicated to social justice. MARY TUTHILL LINDHEIM: AGENT OF CHANGE encourages the viewer to consider the historical and material importance of an artist who created with a true awareness of the impact an artist can make in and out of the formal art world. Although visitors to the exhibition will likely associate the title with Lindheim’s socio-political activism, the phrase "agent of change" also refers to the physical transformations an artist makes to her/his medium. 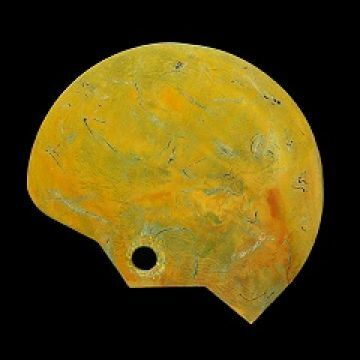 This is particularly true in the case of a ceramic artist, who transforms earth into art and must understand and employ the chemical transformations of ceramic glazes under the heat of the kiln. Mary Tuthill Lindheim, a native of New Jersey who spent her youth in Tucson, Arizona, was especially prominent in the 1940s, 1950s and 1960s, years during which she worked tirelessly on behalf of Bay Area art organizations to which she belonged. An exhibiting sculptor when she began her ceramics studies in 1946, she received a scholarship for advanced research in ceramics in her second semester at the California College of Arts and Crafts. Five years later, she was elected president of the Association of San Francisco Potters. She was concurrently an active leader in the older organization San Francisco Women Artists. Sometimes her dual involvement in art and activism dovetailed, but sometimes they were at odds, challenging her ability to actively promote her own career. She would have it no other way. A passionate advocate for studio craft (which at the time was not considered a "fine art"), Lindheim contributed to the public discourse about ceramics by publishing in Craft Horizons and Ceramics Monthly. In 1958 she was one of the founding members of Designer-Craftsmen of California, and in 1966 she began years of volunteer work organizing and improving the Sausalito Art Festival. She served many times as juror for exhibitions in Marin and San Francisco as well as out of state, and taught ceramics and arts and crafts classes at the California Labor School and the California School of Fine Arts (now San Francisco Art Institute), among others. Throughout her career she traveled and exhibited extensively, but kept her roots in the Bay Area. Her work is now in the John Magnani Memorial Collection at San Francisco State College, the Bolinas Museum, Crocker Art Museum, Oakland Museum of California, Arizona State University, and Mills College, among others. There will be a lecture by curator Heather Murray and a book signing by Abby Wasserman on Saturday, December 10, 4-5pm. MARY TUTHILL LINHDEIM: AGENT OF CHANGE is made possible in part by the generous lending of works and support of her estate, as well as lending of work by Bolinas Museum and the Crocker Art Museum. Additional support provided by the Clay and Glass Artists of California. The Small Treasures exhibition features work under 14" with a bounty of creativity and originality. This exhibition of work by the Artists of MarinMOCA includes media ranging from watercolor and oil painting to sculpture and jewelry. The Artists of MarinMOCA generously donate 50% of artwork sales to the organization, helping us to raise much needed funds.